Good lighting is important throughout a home, and each room has different lighting needs. Kitchens require overhead and task lighting, while bedrooms and dining rooms can benefit from variable illumination. However, no room in the house requires more layers and nuances of lighting than the bathroom, where lighting directly influences the room’s efficiency, utility, safety, and beauty. * Safety — Bathrooms are a prime spot for falls and injuries. A well-lit room can decrease the risk of someone stumbling or slipping. * Tasks — Whether you’re applying makeup or shaving, task lighting can provide the illumination you need to do the job well. * Visibility — Ambient lighting provides whole-room illumination that makes the space usable at any time of day. * Decorative — Lighting can minimize glare from shiny surfaces such as porcelain, glass or ceramic tile, and enhance the appearance of colors, fixtures, and accessories. Bathroom lighting affects safety the most during nighttime hours. A completely dark bathroom could lead to falls, as could the temporary blindness caused by switching on a light when your eyes are acclimated for darkness. A brightly lit space can also make it difficult for you to go back to sleep after using the bathroom. Dimmable bathroom lighting, which can be set for less illumination at night, and strategically positioned nightlights can help users safely navigate the room at night. Equip low-wattage light sources that turn on with a motion sensor, so that soft illumination comes on when you enter the dark bathroom. The bathroom vanity is a hub of activity, where people shave, brush their teeth, fix their hair, apply makeup and generally get ready for the day. The lighting above your vanity or sink area is critical to how well the space functions. Lights above the bathroom mirror, or to either side of it, can create glare and shadow. 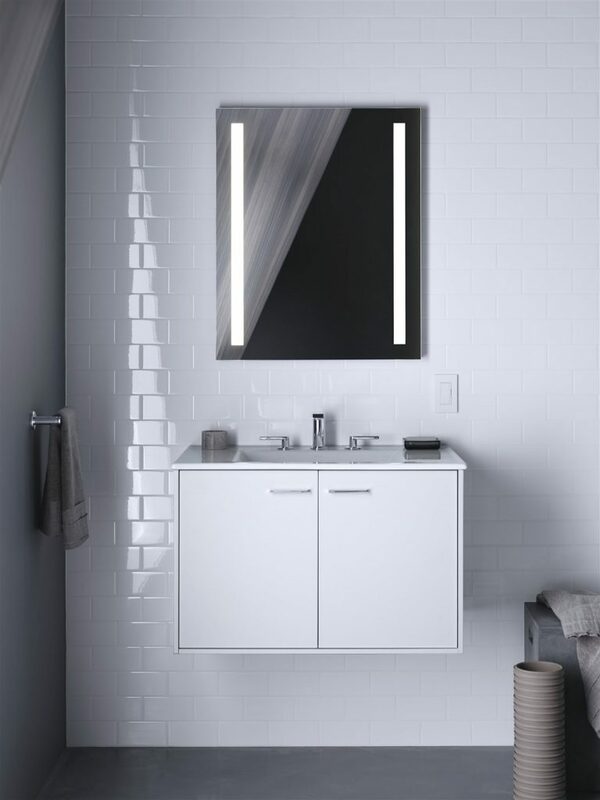 A better alternative can be to use a lighted mirror or medicine cabinet like the Verdera collection by Kohler. Lighted mirrors and medicine cabinets eliminate harsh shadows and light “hot spots” that can come from overhead lighting. What’s more, Verdera lighted medicine cabinets feature a convenient built-in electrical outlet to allow you to use your favorite grooming accessory. LED lights to make the mirrors and cabinets energy-efficient, and all are compatible with LED dimmers, giving you, even more, control over task illumination. Visit www.us.kohler.com to learn more. Certain areas in the bathroom require basic visibility at all times, including showers and water closets. In these areas, overhead lighting can provide the ambient illumination you need. You can opt for a basic light fixture, a fan/light combination that also provides ventilation or even a skylight for natural daylighting. Uplighting is also becoming a popular form of ambient light in bathrooms. Lights set beneath countertops or around the base of shower stalls provide soft illumination and character. Decorative bathroom lighting is your chance to have some fun. These lights may enhance ambient lighting or support task lighting, but their ultimate purpose is to add visual interest to the bathroom. Depending on the size and style of your bathroom, you can choose decorative lighting options like chandeliers, wall sconces, pendant lights, recessed lighting and more. Finally, be sure that every layer of light in your bathroom is as energy efficient as possible. Replace any incandescent bulbs with LEDs or CFLs, which use a fraction of the energy to produce a comparable amount of light, while lasting far longer.